by 1960 was well established as a new suburb of Philadelphia, albeit just outside the typical commuting ring: many families had taken occupancy in the community's four neighborhoods, the main shopping center had opened the previous year, its first church and supermarket had opened, and two schools had been completed. In fact, by the end of 1960, Levittown, N.J. would experience significant growth in its infrastructure and services. Two more elementary schools would open, as would the high school. The public library, fire company, and emergency squad would also be established. By the end of 1960, the township's population would grow to 11,861. 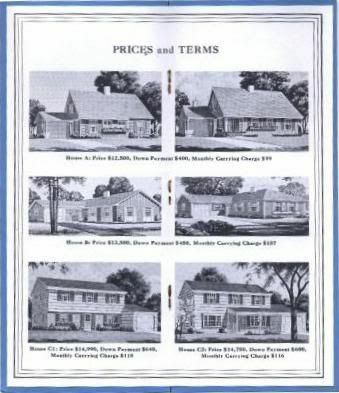 Despite the apparent prosperity being experienced by the new Levittowners, sales of new homes began to decline after reaching an all-time high of 2,174 in 1959. 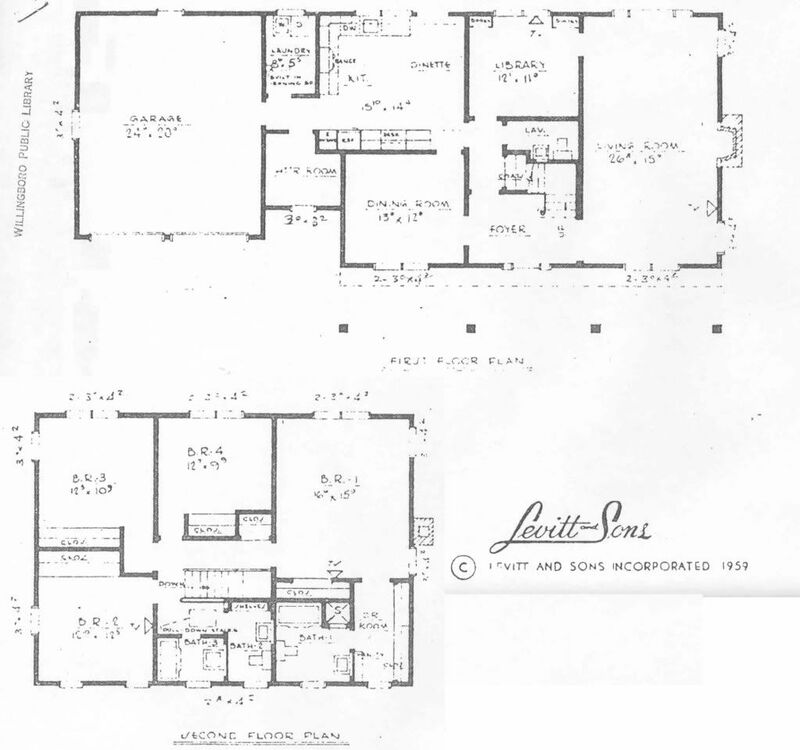 Following a series of modifications to the houseline in 1959, Levitt and Sons was doubtless beginning to feel the effects of a soft houing market. 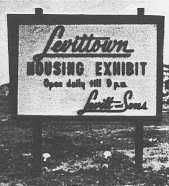 People were still coming to Levittown, but the sales did not reflect what the company was used to and were certainly not commensurate with its most complete community yet. So Levitt turned to diversification. The first change was by completely redesigning the one-story home. 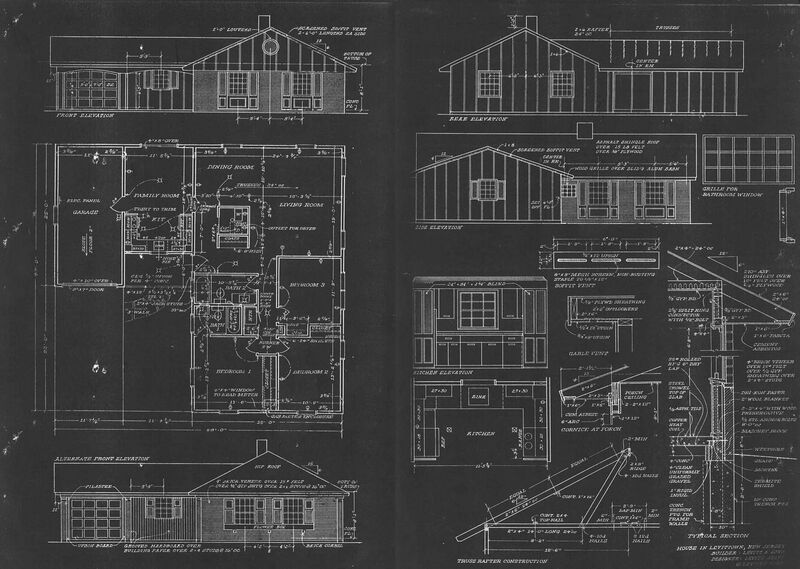 After a failed attempt to modify the exterior of the original one-story for the 1959 houseline, a new House B was introduced for the 1960 houseline. With this change, Levitt found success: the new model became the hit of the development. 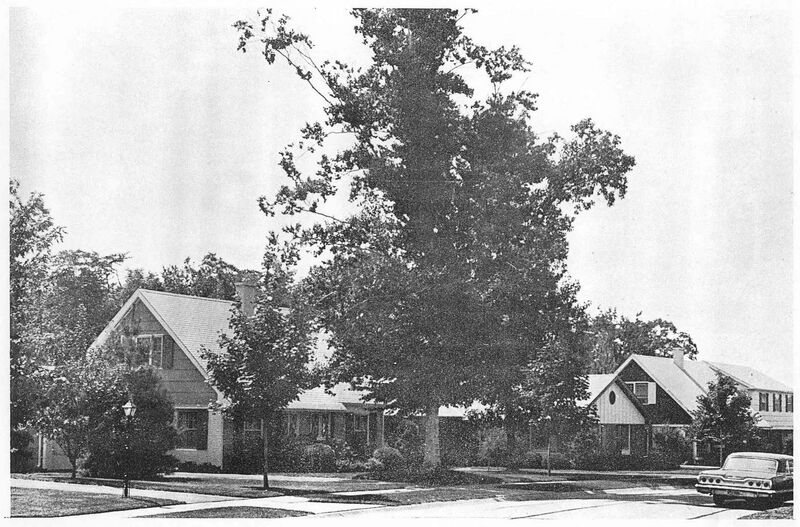 It became so popular, the Levitt would eventually introduce an alternate exterior for the 1961 houseline, to maintain a balance between the three styles of homes. The second change spoke much more directly to diversification: two new models, the Manor House and the Country Clubber, would be introduced into the houseline for the move-up market. While the price range for the standard houseline was between $12,000 and $15,000, the two new models were priced above $20,000. Both offered four bedrooms and up to three baths, as well as such higher-end features two-car garages, family room or library, and, in general, very large rooms. In addition, the two new models were situated on larger homesites in a separate wooded section with rolling terrain. Of course, in a softer market, the more expensive models sold much more slowly than the standard models. Even though total sales would drop to 848 for 1960 (down from a high of 2,174 the previous year), these changes would signify the beginning Levitt's ability to weather the market and and change course to respond to a changing housing demand. Over the next few years, this ability would prove even more necessary to Levitt and Sons, as the market slump was only in its beginning stages. View the original Information Booklet introducing Levittown, N.J. and the 1960 homes The booklet features a brand new House B--the one-story model, now available in two exteriors--that includes not only a Family Room, but also aluminum Sliding Glass doors to the back lawn that let the outdoors right into your home! Tour all six sample homes and select the style of your new home in Levittown. In addition to the four home plans that you have come to know at Levittown, two completely new homes are being introduced that will offer an even greater selection and variety in this wonderful community. These fine new homes are available in Levittown's Windsor Park neighborhood on large, wooded homesites. You're sure to find the home at Levittown that you've always dreamed of! And remember, at Levittown, there are no hidden charges--"the price we say is the price you pay!" 1-1/2 Story (Cape Cod). 4 Bedrooms, 2 Baths, Covered side entry, Living Room with door to back lawn, Front-facing Kitchen with Serving Counter to separate Dining Area, Folding Screen between Living and Dining Areas, One-car Garage. 2-Story Center-hall Colonial. 3 Bedrooms, 2-1/2 Baths, Covered Entry, Entry Foyer, Front-to-rear Living Room, Formal Dining Room with built-in China Closet, Kitchen with Separate Wall Oven and Countertop Range, Serving Counter to Family Room, Rear Family Room with door to back lawn, Laundry-Utility Room with Washer and Dryer and Garage Access, Master Bedroom with two Walk-in Closets, One-car Garage. 2-Story Center-hall Colonial. 4 Bedrooms, 2-1/2 Baths, Brick Front, Entry Foyer, Front-to-rear Living Room, Formal Dining Room with built-in China Closet, Kitchen with Separate Wall Oven and Countertop Range, Serving Counter to Family Room, Rear Family Room with door to back lawn, Laundry-Utility Room with Washer and Dryer and Garage Access, Master Bedroom with two Walk-in Closets, One-car Garage. 1-1/2 Story. 4 Bedrooms, 3 Baths, Front Portico or Overhead Trellised Entry, Cut Stone Front, Entry Foyer, Living Room with Bay or Box Window and Fireplace set into Wood Paneled wall, Formal Dining Room, Kitchen with Separate Wall Oven and Countertop Range, Dishwasher, Serving Counter to Family Room, Rear Family Room with Sliders to back lawn, Laundry Room with Washer and Dryer and Garage Access, First-floor Master Bedroom with Dual Closets, Guest Bath with Wall-wide Vanity area, Upper Level with Two Bedrooms, Bath, Attic Storage areas accessible from upper hall and bedroom, Oversized Two-car Garage with Storage Area. Available in traditional or contemporary exterior. 2-Story Center-hall Colonial. 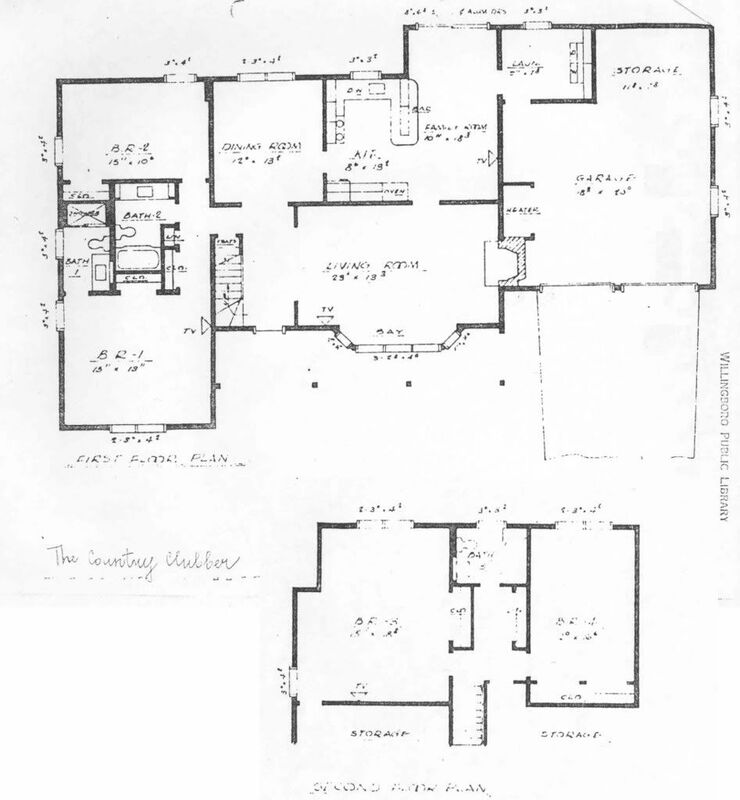 4 Bedrooms, 2 Baths, 2 Lavatories, Columned Portico or Covered Front Entry, Brick Front, Entry Foyer with Turned Staircase, Front-to-rear Living Room with Fireplace, Formal Dining Room, Wood-Paneled Library with built-in Bookcases, Eat-in Kitchen with Separate Wall Oven and Countertop Range, Dishwasher, Windowed Countertop area, Service Door to back lawn, and Garage access, Laundry Room with Built-in Ironing Board, Utility Room, Master Bedroom with Dressing Area and Walk-in Closet, Master Bath with tub and separate Glass-enclosed shower, Dual Main Bath with separate Lavatory, Attic Storage accessible with Pull-Down Stairway, Oversized Two-car Garage. Available in traditional exterior with Columned Portico or Provincial exterior with Covered Entry.